It was back in 1986 when Hal joined our team. His family moved to Huntersville to be closer to family. Initially Hal ran the Appliance division then began working in the plumbing contracting division soon thereafter. Hal gained his State Plumbing Contractor’s license & when Bobby decided to retire in 1992, Hal became President of the company. He is originally from Roxboro, NC & graduated from NC State University. Hal oversees the management end of the company & lives in Huntersville. In his spare time, Hal enjoys cooking, photography, reading & gardening. Started with North Mecklenburg Plumbing in 1985, apprenticing under Bobby. He gained his Mecklenburg County Journeyman’s license, holds his State Plumbing Contractor’s license, & became a partner in the company in 1997. Robbie is mechanically gifted & very knowledgeable technically. He oversees the field crews & meets with both contractors & individuals to assess & price jobs. After living in Kannapolis for 19 years, he & his family moved to Huntersville in 2013. Robbie enjoys spending time with his family, especially riding with his wife in his Mustang convertible! Has been with North Mecklenburg Plumbing since 1999. David is a meticulous Warehouse Manager & handles Purchasing for our various jobs whether they are commercial or residential, new construction or service calls. He also assists with estimating & pricing jobs as well as preparing proposals. David is a graduate of UNCC with a degree in Business Administration & lives with his family in Mooresville. His hobbies include boating, reading, & cycling. Started his career with us in 1998. Ken holds his Mecklenburg County Journeyman’s card & is a State licensed Plumbing Technician. Ken’s experience includes both commercial & residential new construction, remodel/renovation, commercial up-fits, & service work. Ken and his family live in Cornelius and he enjoys hunting in his spare time. Starting as a high schooler in 1996, Travis began with North Mecklenburg Plumbing as a part-time student intern working in the warehouse. He then apprenticed & gained his Mecklenburg County Journeyman’s card & now is a State licensed Plumbing Technician. Travis’ experience includes both commercial & residential new construction, remodel, up-fits, & service work. Travis lives in Olin where he likes to work on cars and enjoys spending time with wife & family. Dave began his career in the plumbing industry in 1983 & with NMP in 2015 . His experience includes both commercial & residential service work. Originally from upstate NY, Dave moved to NC in 1996 & lives in Huntersville. When Dave is not busy with yard & home maintenance projects, he enjoys relaxing in front of the computer checking for online deals. Michael began with North Mecklenburg Plumbing in July 2014. He is originally from Georgia. Michael is eager to learn the plumbing trade & is apprenticing with us. His hobbies include singing & playing several musical instruments including the piano, guitar, bass, & harmonica. He also enjoys sharing his faith & fishing. Chris joined our team in May of 2017 and we are lucky to have him. He has over 5 years experience first in commercial plumbing, then in service work. Chris was raised in the desert of New Mexico & has recently moved to NC to pursue more opportunities & expand his knowledge in plumbing, home construction & design. Luke Hester, who represents a 3rd generation working in the business, started with North Mecklenburg Plumbing 3/1/16. He has worked in both new residential construction, as well as commercial & service plumbing. Luke lives in Huntersville & helps lead worship at Connections Church in Belmont where he plays guitar & sings. He is an avid sports fan especially the Carolina Panthers. 1994 is when Julie started with the family business. She is the company accountant & office manager, oversees weekly & quarterly payroll & year-end functions, as well as Human Resources & Insurance needs for the company. Julie is a native of Huntersville & a graduate of Meredith College in Raleigh. After a 10 year absence, she moved back to Huntersville with her family in 1986 wanting to enjoy the blessings of having extended family nearby. Julies hobbies include scrapbooking, reading and travel. 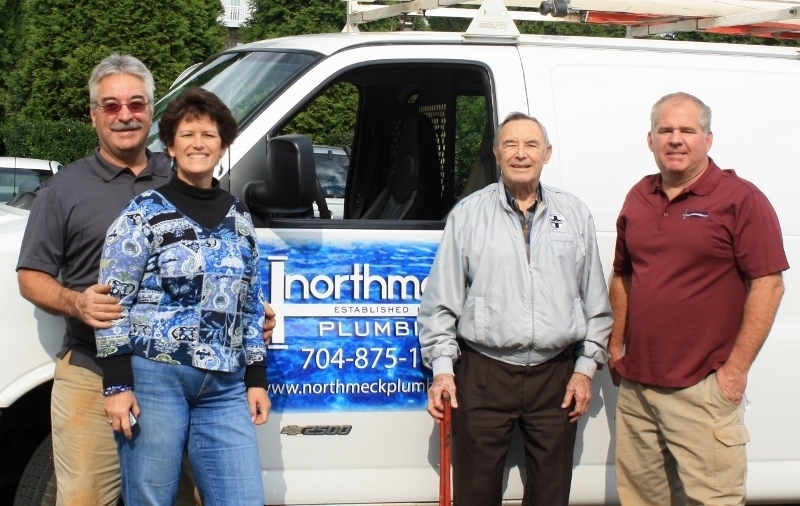 Has been with North Mecklenburg Plumbing since 2000. She will usually be your first point of contact when you call our office between the hours of 8 & 5. Yes – we still have a live person answer our phone! In addition to answering the phone, as office coordinator, Vickey schedules service requests, handles the accounts payable function for our company & a myriad of other office duties. Originally from California, Vickey has been in the Huntersville/North Meck area since 1990. Vickey enjoys travel and is a movie buff.